"Mimosa speciosa" redirects here. As described by Nikolaus Joseph von Jacquin this refers to Albizia lebbeck. The Mimosa speciosa of Carl Peter Thunberg, however, is Albizia julibrissin. 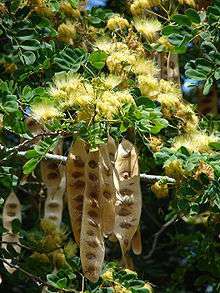 Albizia lebbeck is a species of Albizia, native to Indomalaya, New Guinea and Northern Australia and widely cultivated and naturalised in other tropical and subtropical regions. English names for it include lebbeck, lebbek tree, flea tree, frywood, koko and woman's tongues tree. The latter name is a play on the sound the seeds make as they rattle inside the pods. Being one of the most widespread and common species of Albizia worldwide, it is often simply called "siris" though this name may refer to any locally common member of the genus. It is a tree growing to a height of 18–30 m tall with a trunk 50 cm to 1 m in diameter. The leaves are bipinnate, 7.5–15 cm long, with one to four pairs of pinnae, each pinna with 6–18 leaflets. The flowers are white, with numerous 2.5–3.8 cm long stamens, and very fragrant. The fruit is a pod 15–30 cm long and 2.5-5.0 cm broad, containing six to twelve seeds. Its uses include environmental management, forage, medicine and wood. It is cultivated as a shade tree in North and South America. In India and Pakistan, the tree is used to produce timber. Wood from Albizia lebbeck has a density of 0.55-0.66 g/cm3 or higher. Even where it is not native, some indigenous herbivores are liable to utilize lebbeck as a food resource. For example, the greater rhea (Rhea americana) has been observed feeding on it in the cerrado of Brazil. Lebbeck is an astringent, also used by some cultures to treat boils, cough, to treat the eye, flu, gingivitis, lung problems, pectoral problems, is used as a tonic, and is used to treat abdominal tumors. 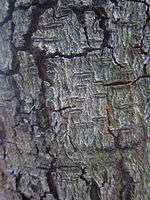 The bark is used medicinally to treat inflammation. This information was obtained via ethnobotanical records, which are a reference to how a plant is used by indigenous peoples, not verifiable, scientific or medical evaluation of the effectiveness of these claims. Albizia lebbeck is also psychoactive. The tree is called vagai in Tamizh. In ancient Tamil culture, the flowers of the lebbeck decorated as a crown were used to welcome victorious soldiers. The taxonomic history of A. lebbeck is somewhat convoluted. It was originally described by Carl Linnaeus as Mimosa lebbeck. George Bentham placed the species in its present genus, but other authors believed that the plant described by Linnaeus was the related Albizia kalkora as described by Prain (based on the Mimosa kalkora of William Roxburgh), and erroneously referred to this species as Albizia lebbeck. However, Francisco Manuel Blanco used Mimosa lebbeck to refer to Albizia retusa ssp. retusa. In addition, the specific epithet is occasionally misspelled lebbek. Albizia lebbeck (L.) Benth. var. leucoxylon Hassk. Albizia rostrata Miq. is Archidendron globosum. Mimosa speciosa Thunb. is Albizia julibrissin. There also exists a genus named Lebeckia, in reference to the lebbeck. It is not closely related to A. lebeck however, but a member of the Faboideae, a different legume subfamily. Duke, James A. (2008): Dr. Duke's Phytochemical and Ethnobotanical Databases - Albizia lebbeck. Retrieved 2008-FEB-23. International Legume Database & Information Service (ILDIS) (2005): Albizia lebbeck (L.) Benth.. Version 10.01, November 2005. Retrieved 2008-MAR-30. United States Department of Agriculture (USDA) (1994): Germplasm Resources Information Network - Albizia lebbeck (L.) Benth.. Version of 1994-AUG-23. Retrieved 2008-MAR-30. Wikimedia Commons has media related to Albizia lebbeck. Dressler, S.; Schmidt, M. & Zizka, G. (2014). [http://www.africanplants.senckenberg.de/root/index.php?submitForm=true&page_id=77&searchTextMenue=Albizia+lebbeck&filterRegionIDs=6&filterRegionIDs=1&filterRegionIDs=2&filterRegionIDs=3&filterRegionIDs=5 "Albizia lebbeck"]. African plants – a Photo Guide. Frankfurt/Main: Forschungsinstitut Senckenberg.